Hello Dealsnloot Readers,Crownit has come back with special offer through which all bms users will get 100% cashback on Bookmyshow Vouchers,Offer will on today 3pm and only 2500 vouchers will available.Offer valid only on Crownit mobile app so guys be ready for this loot offer.Grab This Loot Deal and Get 100% Cashback Loot. 3.Visit to ‘Movies’ category in app. 5.Now pay the amount with available payment mode. 6.You will receive voucher via sms and email and cashback instantly in your crownit account which can be use on further transactions. 7.Use Cashback on Amazon, Flipkart, Jabong, Bookmyshow and for phone bills payment. 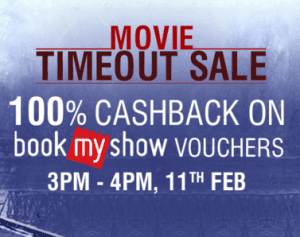 Get 100% cashback on Bookmyshow voucher on Crownit app. Starts 11th Feb 3 PM.